PLFM NEW CEO Jeffrey Moore. According to Letter updates will be out before or on September 30, 2018. PLFM new CEO Jeffrey Moore is CEO of Nutripy, inc.
After 35 years and winning over 200 awards in healthcare advertising, Jeffrey Moore quit. He has left what he now calls “Ill Care” to pull back the curtain, giving everyone access to the finest supplementation to optimize the lifestyle they choose. 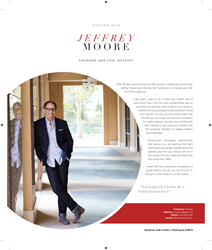 “Not all nutritional products are created equal” say’s Jeffrey Moore, who is featured in the November issue of Modern Luxury Magazine as this years ‘Modern Man’ for his accomplishments with Nutripy. As a veteran of healthcare advertising Jeffrey Moore constantly sorted through what was broken and came up with better solutions. Now that applies to the broken system for nutrition and supplementation. The current problem is OTC (Over-the-Counter)supplements are not regulated by the FDA. Many of the OTC supplements found on the retail shelves are filled with chemicals, binders, fillers, dyes and unknown substances. And there are widespread cases of the active ingredients listed on the label not even being in the products. The OTC makers do not need to prove safety or effectiveness. “We really don’t know what’s inside the OTC supplements. 5 factories in China, which has been cited 20 times in the last two years for manufacturing violations, supply 90% of the supplement ingredients on store shelves and the FDA cannot inspect a single factory there”, says Jeffrey Moore. There are superior products. Yet today’s distribution of pharmaceutical grade supplements is primarily through alternative healthcare practitioners. Some doctors seeking extra income have turned nutrition into a side business selling supplements out of their offices, even aligning with Multi-Level Marketing brands. While it's not clear how many health-care professionals engage in this practice, a survey published in March 2010 by the trade publication Nutrition Business Journal showed of 600 medical doctors, naturopathic physicians, chiropractors, nutritionists, and other practitioners revealed 76 percent sell supplements from their offices. That remarkable figure does suggest that a significant number of mainstream medical professionals are now vying for a share of the $31 billion-a-year U.S. supplement market. Yet nutrition is taught little, if anything at all in today’s medical schools. So, why are people taking supplements? Most Americans want to be at their best to handle very busy lifestyles and as a result the supplementation industry is booming. Some consumers mistakenly view supplements as a way to make up for a poor diet. This trend has benefited the VMS (Vitamin, Minerals and Supplements) industry because many supplement purchases are the result of consumers self-directing their health regimens. Keep your eyes open for Nutripy.com, the first online membership site that delivers superior nutrition supplements with healthy meal plans for each person’s lifestyles and goals. Also impressive is access to live nutritionists and individualized health assessments that allow their member’s access to the highest quality supplementation only available to healthcare professionals.